This month, Magical Blogorail Red is sharing our favorite Walt Disney World restaurants for character dining. I've covered this before (click here) so I am going to take a slightly different approach from what I expect the rest of the gang is doing. I'll be briefly discussing the character meal locations within the theme parks. Crystal Palace: Serves buffet breakfast, lunch and dinner. Characters are Pooh, Tigger, Eeyore, and Piglet. I prefer breakfast here over the other meals. I love how bright it is in the morning and it's a fun way to start the day. I find buffet character meals to be chaotic and this one is no exception but a Pooh bear hug seems to make it better. And my children eat breakfast better than any other meal, so that helps it be a more enjoyable experience. Cinderella's Royal Table: Serves plated breakfast, lunch and dinner. The characters are Cinderella and her royal friends (no specific list is guaranteed.) For those on the Disney Dining Plan, two table service credits are required. A photo package is included in the cost. This used to be a family favorite going back to the King Stephan's days but I haven't been here since 2005. At that time it was my choice for my post-marathon celebration dinner and other than the occasional meet and greet with Cinderella in the lobby, characters were not involved except at breakfast. I have two little girls so I am sure we will dine with Cinderella in the future. Since we are frequent WDW guests, I am spacing out some of the quintessential Disney experiences to make them more special. I think both of my girls will be the perfect age for this in about two more years. Garden Grill: We've dined here a few times, most recently as May 2013. This is a dinner served family style and Mickey, Pluto and Chip and Dale visit each table. The food here is very good and I have an overall good impression of the place. Gotta love a rotating restaurant. On our last visit, it seemed very hot and very loud but it just wasn't our best night so I'm not sure anywhere would have worked out smoothly. Ridge with Mickey in February 2007. I don't think Mickey's costume has changed. Princess Storybook Dining at Akershus Royal Banquet Hall: One word: Fabulous! Akershus offers breakfast, lunch and dinner with an assortment of princesses. A photo package is included. The hot food is brought to your table and a cold buffet is available as well. My brother and I had lunch at Akershus many years ago and other than a running inside joke, the experience didn't inspire us. Now this is a character dining location and it's wonderful. On our girls only trip in January 2013, we had the best time here. I can't do it justice in a paragraph. You'll just have to check out the review. Me, my girls, my BFF, and Belle. 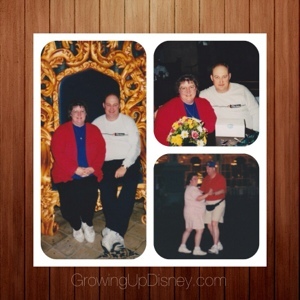 One of my favorite Disney moments. Play 'N Dine at Hollywood and Vine: Breakfast and lunch buffets with characters from Disney Junior shows. I haven't been yet since my girls didn't really know the characters well enough to spend more time and money on character meals. However, Janine from our Minnie Moms had a fantastic time there for breakfast. Tusker House: African-inspired breakfast and lunch buffets with Donald greeting outside the restaurant and Minnie, Daisy and Goofy visiting inside. Dinner is not a character meal. We have had lunch here twice since it changed format from counter service to buffet and both experiences were very good. One of the advantages of writing a blog is being able to look back at what you thought in the past. After Tink's first WDW for her first birthday, I reviewed Tusker House as our best meal of the trip. We took both girls to the character buffet there in November 2012 and also had a good time. As I've said before, my girls eat breakfast well and we made our first pass on the buffet during the transition from breakfast to lunch. I was able to get Mickey waffles for the girls and the adults could begin to enjoy the seafood stew, samosas, and the other lunch offerings. As with other character meals, it was hectic for a time but the restaurant seemed to settle down about halfway through our meal. The best pictures at character meals tend to come when the restaurant is slow, so the beginning or end of a meal period can work out well. We love Tusker House. I think we're going to give Garden Grill at try soon. Love all the photos! You've mentioned a lot of our favorites! My kids especially love Play and Dine. You should definitely try it! So much fun! We love Tusker House and Akershus also. 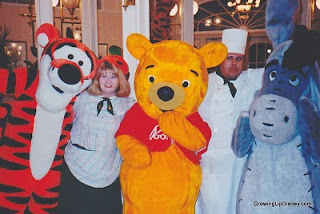 It's been a few years since we've done Crystal Palace, but meeting the Pooh characters is always fun. We did Garden Grill on a bad day as well - I keep thinking we need to allow a do-over of that one. Thanks Amy!! I didn't even know about Play and Dine. You were so cute in your Crystal Palace uniform!! I love Garden Grill and Tusker House! 2 of my favorites! Crystal Palace breakfast is my favorite. We have had the best character interactions with Pooh and the gang. Crystal Palace was our first character meal and truly was a ton of fun. Actually, just Mary Ann and I attending, but we love these characters and the meal as well. And a nice selection of meals in this story. 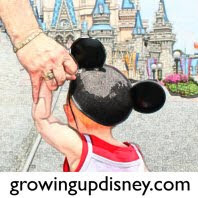 This awesome post is exactly why I was excited for MB Red to cover character dining this month. What a great overview! I'm planning our next trip, and there are a couple on your list that we have not tried that we are going to try... now I'm even more excited! Thank you!